This is how one of the founders of Romanticism, S T Coleridge started his poetry, titled Kubla Khan, which is often regarded as one of the best examples of Romantic poetry. Coleridge was under the after effects of opium, when he had a vision, and he immediately started to write, so as to produce such a miraculous work called Kubla Khan. Why I am telling this story? Because, Right now, what makes me write is the effect of a favorite Scotch Whiskey, Black Dog. Hence, point number one is that the Black Dog Scotch Whiskey can stir up the creativity in people. So, that was the joke with which I wanted to open this article. 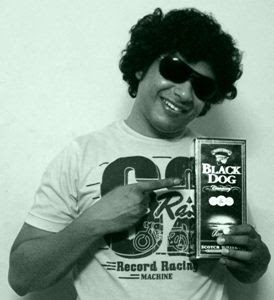 But, still the topic is the same, and Black Dog has still that significance. Recently, I was gifted a bottle of a Black Dog Scotch Whiskey, by a team called Ginger Claps. Needless to say, just one sip of it made me fall in love with its aroma and taste. This special blend, which is a product of United Spirits Breweries has become my favorite drink. I will need to tell you a little bit of history behind the inception of this unique whiskey. The birth of Black Dog Scotch took place over 125 years ago when James MacKinlay of the second generation of the Leith Scotch Whiskey blending family launched the masterful whiskey by the name of Millard Black Dog. It is said that in the year 1883 Walter Millard, a Scot from the British East India Company came searching for the perfect Scotch and eventually discovered the great taste of this whiskey in these misty shores of Scotland. It is said that, Walter Millard named the whiskey Black Dog Scotch, in honour of his favourite salmon fishing fly used in the Spey and Tay rivers of Scotland since he was very fond of angling. Black Dog Scotch comes in four variants, namely, Centenary, De Luxe, Reserve, and Quintessence. I am going to reveal my experiences with Centenary. When talking about the Centenary variant, it has to be noted that this variant is blended to perfection with a multitude of malt spirits chosen from the various regions of Scotland. 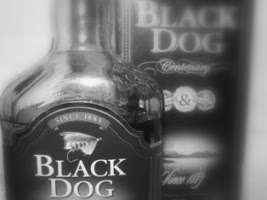 Black Dog Centenary is a rich and rare premium blended Scotch whiskey loaded with exceptional characters. Its particulars are as following. Aroma: Matured wood, toasted malt, mild honey sweetness, delicate butterscotch bordering on cream, with floral nuances that emerges at the end. Palate: Robust body, pronounced rich malt and oak and sherry sweetness, spreads warmly in the mouth like silent sea waves. On a personal level, I found the smell of Black Dog something extra ordinary. It is very different from common whiskey products. As we smell it, our olfactory glands will prompt us to sense its smell more and more. That was a very unique experience comparing to my previous experiences with other brands of whiskeys. The taste is not going to burn you down, quite unlike other whiskey products. It will give you a soothing effect, and you will be having the same control over your nerves even after four or five pegs of it. But still you will be ’high’. How is it possible? Just taste it! You will know! And you will be an admirer of Black Dog Scotch Whiskey after that just like how I became one. I've never tried Black Dog, but you make it sound wonderful. Love your descriptive words. I'm glad you are succeeding with the commercial aspects of your writing.